Quick itch soothing, calming and cooling essential oils of Camphor, Birch and Clary Sage are absorbed. 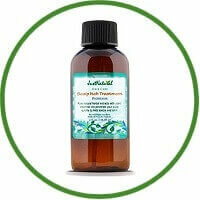 Tea Tree, Oregano and Neem oils help balance your scalp and hair follicles. Calendula Flower extract provides additional soothing as Vitamin E helps to balance to your scalp. This formula for psoriasis scalp itch is gluten and alcohol free.